Jazz up any brewing vessel with the Kombucha Kamp EXCLUSIVE Brewer Tee. Specially designed to fit snugly around our 2.5 gallon Modern Porcelain Continuous Brewers, this stretchy tee not only holds your heat strip in place but also keeps it discreetly out of sight. The T-shirt set also comes in slightly smaller size to fit the Stainless Steel vessels (2.2. gallon). Select "Stainless Steel Size" from the dropdown menu to select the smaller size. Machine washable cold water. Handmade in the USA. The Brewer Tee set really tidied up my Kombucha Brewer. No more fixing a towel, rags or hand-me-downs around the vessel. With the vessel covered, there is better temp control, the heater is covered and fruit flies are mostly kept away. No more towels draped over my kombucha batches! This set is a a cozy wrap for my one gallon batch jar. A very neat look for the batch I have brewing in my office. No messing with rubber bands. Slips right over my heater. I have the avocado green tee set and love the way it covers the Ferment Friend heating system on my CB, giving a neat and tidy look to my brewer. Looks attractive on my kitchen counter. I've been brewing 6 months and have had no problems with fruit flies thanks to the brewer cap. I love these brewer t sets. I had a black one and I absolutely fell in love with the Royal Blue color. Excellent quality and the perfect fit. They protect your brew from an overabundance of light, add a layer of warmth, keep contents free from contaminants (dust and fruit flies, etc. ), and really dress things up. They make your jars of Kombucha look quite beautiful while sitting on your counter top. I highly recommend. I adore this tee set! So cute, fits my gallon jar perfectly, and it comes in purple! Love it! The brew cap was ingenious! Seriously, it's way better than using a cloth and rubber band. The different color options are great too! Love, love this Brewer Tee set. Moved my 1 gal jar to a desk in my bedroom at Thanksgiving as I needed the counter space in the kitchen. It looks like it belongs there! The brewer tee and cap are so cool - I get comments all the time how great my brewer looks on the kitchen counter (5 stars for the quality of the tee and cap). Perfect fit for my continuous brewer. Highly recommended. I wish I'd bought one of these sooner! As in before I lost a batch of booch to a fruit fly infestation due to using a plastic ring and cloth top that I did not purchase from Kombucha Kamp. Hannah's cap works really well to keep out dust and fruit flies. It fits on easily and stays on. The T-shirt covers my continuous brew keg and heater and gives it a neat and discrete appearance as it sits in the corner of my home office. This cover is a must. I have having a hard time maintaining proper temperature. Put on the cover and it's perfect temperature now. Bonus is it keeps everything looking neat and tidy. Wish I had ordered it when I ordered my starter kit. I purchased the teal and love the color. I admire this for it's beauty and functionality! The brewer tee set is lovely to look at but also serves a purpose. It helps hold the heating strip in place and with retention of heat keeping the kombucha in the perfect temperature range. I agree with the positive reviews: easy to fit into the CB vessel; great, uniform aesthetics over the heating element; nice insulation for the heating process. I would order it again if I get another CB vessel. , I purchased the teashirt which also helps to keep the heat strip remain in place. My kombucha brew vessel is so cute with the royal blue teashirt and matching frilly cap. Oh and thank God for this vessel cap which keeps fruit flies, dirt and other small household debris out of my kombucha. My only regret is that I didn’t purchase additional caps and teashirts when I placed my order. Ah well. Those will have to go on my wish list. Thanks to another reviewer I ordered the Brewer Tee and I was so thankful that I did. Because I ordered it at the time I ordered the complete continuous brewing system it was discounted which made it particularly nice. The Tee is really attractve the avacado went with my decore beautifully. I think it has helped keep the temperature stable when we have had cooler days. It is easy to take on and off and I suggest taking it off when filling the crock so it doesn't get soiled. No problem if it does since it washes nicely and doesn't need ironing. There is a slit for the spigot and it is the perfect spot to place the temperature strip so one can easily see it. I also placed a piece of masking tape under the Tee near the top so that I could record when I fed it. I think it looks more finished to have the tee and cap rather than just the cap. Very well constructed too. I love the look of this tee, and I love that it hold the heater against the crock and also covers it, giving my set-up a sleek look. Very nicely made, good quality fabric and design. I find it a little hard to put the top on, but am getting better at it. I would like if it was available in some other colors. The Brewer's Tee Set is a great cover for your brewer. It already has a spigot hole and a slit so you can see your thermometer with ease. The set is made of a light weight cloth which is perfect for the needed air circulation for your brew, but strong enough to keep out the unwanted. I think it adds a great look to the brewer. Such a great addition to the continuous brew system! I love that it holds the heater in place and that the cover stays on tight. It's well designed to accommodate the temperature strip and spigot. Well done! I didn't order this with my brewer order because I thought it was just to dress up the brewer. After I set up my brewer I realized the tee set would do a great job holding the heater in place and helping to conserve energy. It also looks great in addition to being practical. Just received my order for the brewing t-shirt and am happy to report it is a perfect fit. I love this T shirt set. It looks great in my kitchen and its kind of a conversation piece. I had a potluck here a few weeks ago and everyone kept asking what it was. It was the perfect platform to introduce everyone to kombucha! The best part is, it actually has a function, it keeps my brew cozy and helps it retain its heat. Im glad I bought this! I ordered this along with the No Frills Continuous Brewer Package as a first time 'booch brewer. I love it! It looks nice on my counter top and adds a little extra insulation for my SCOBY's new "house". 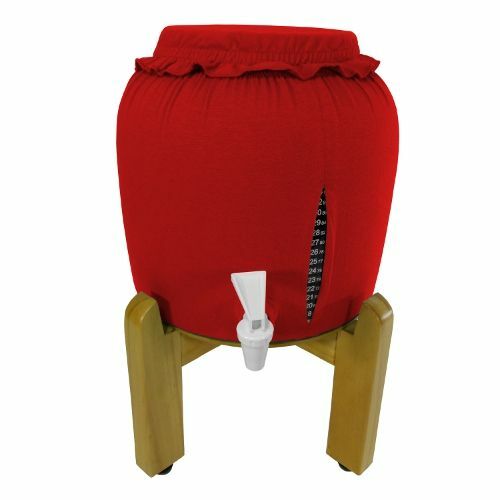 The top stays on securely and Tee part slips on easily over the spigot. I'm really happy I added this to my order. I ordered this as a 'first-timer'. The people at KK couldn't have been more helpful - both before and after I bought. When it arrived (more quickly than I had anticipated) it was well-packaged and lived up to my expectations. The products really work! I shall be back. Thanks. Purchased the cover for my continuous brewer crock. I had a purple one but love the fact I could order one that matched my kitchen. Fit is awesome, washes up great, way better that the towels I had to fuss with. Deff. worth the money! Thanks for all you do. I LOVE the T set! It looks great and the heating strip hides beneath it. The cover is tight - no fruit flies are getting into my kombucha! I am so glad I ordered these. I have them in olive green. My two CB's look so nice and stylish sitting on top of my dryer. There is a nice slit so you can read the thermometer and they are nice to hold the heater on the CB as well. I especially love the lid cover - great quality and I know my KT is well protected but receiving air flow. I am so glad that I purchased the tea set with my brewing system! It looks very attractive in my kitchen and matches the decor beautifully. My system looks well-dressed at all times! However, the tea set does more than just look nice; it provides an inconspicuous place for the heater and the thermometer strip. When people come into my kitchen, they notice my brewer immediately because of the beautiful green tea set. This give me an opportunity to tell them about KT and how much my husband and I love drinking it. I love the process, too! Thanks for being so thorough and helpful, Hannah. I am a happy camper! Hey, thanks for coming up with this one. Can't beat it. And folks, just go ahead and get the 3 pack. If you start continuous brewing and you really get into it your going to need the extras. I started 6 weeks ago. Now I have 2 continuous brew vessels brewing away and 2 more vessels awaiting start up. The heater with the dimmer switch is a must as well. Thank you, Hannah. I love my tee set. It really keeps my brewer/heater system looking great sitting out on the counter. My brewer and stand looks great alone but with the heat strip wrapped around it, it looks like quite the production. I am so glad I ordered this tee set to tidy it all up, looks like just another countertop appliance. 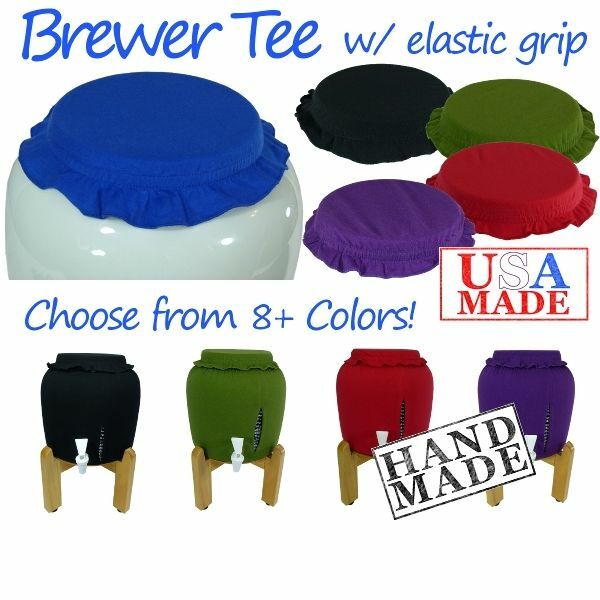 This Brewer Tee set fits snugly and looks great. Not only is it cosmetically pleasing (it hides the heating system beautifully), the clever cap allows the brew to breathe. The cap's elastic clings to the slick ceramic quite effectively. I love the very pretty rich royal blue color of mine(I had a hard time choosing a color). 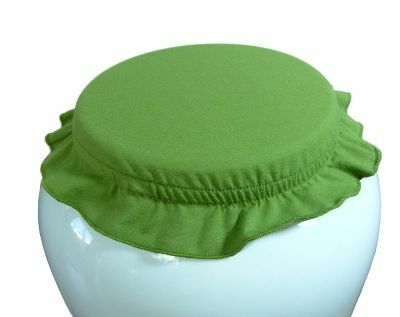 Bonnet and cap fit like a glove on my crock. Got mine in green and it looks great in my kitchen or I can say it blends in with my kitchen and at times I do not even notice that my brewing crock is even there. Love the cap and the thermometer strip. I think this is a must have. The tee set consists of quality materials and quality construction making it well worth the price. I wish KK sold a tee set pattern as well. I would love to choose and sew my own materials to mix it up! This works great! I love the caps especially and bought 3 more. They work so much better then using a rubberband and a cloth. I got this adorable little set in purple to go over my continuous brewer and heater. 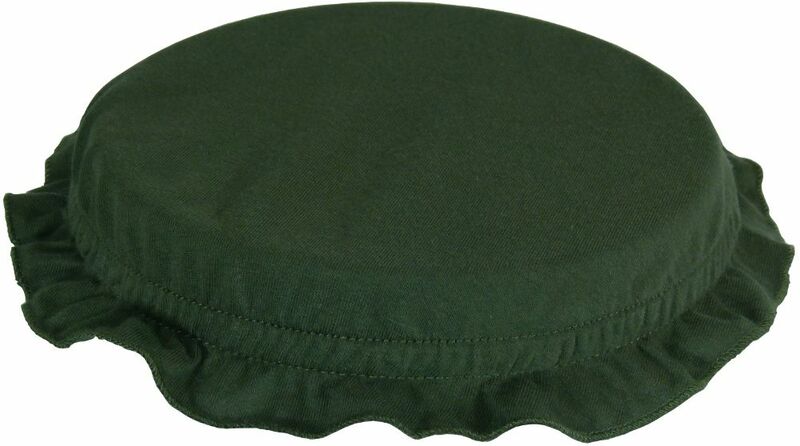 The cap is really easy to take on and off and I love the slit so I can monitor the temperature of my brew. I'm more than happy with this set! This so much more than "looks good" ... it keeps the temperature steady and keeps "unwanteds" out! Made perfectly, fits perfectly, and performs the best! For it's usefulness, it's a bargain!!! I'm just setting up a continuous kombucha brewing system for the first time, after having been too scared thinking that it was too complicated. KombuchaKamp makes it really easy with really great and clear information on the site. I had set up a 2.5 gal crock with a towel over the top rubber-banded to the plastic ring that comes with it, but not only was there oftentimes an opening between the "tea-towel" and the crock, the brew wasn't brewing because it was too cold! I bought the deluxe heating system, and this Brewer Tee set to go over it and tidy it all up. I noticed that the brewer tee is like a little climate control system as well, moderating the swings of temperature by keeping moving air away from the crock and by providing a small captured layer of air which the heater keeps at an even temperature as well. And I had no idea how well the bonnet would go over the top, but it's actually quite amazing. The bonnet/cap has a rubbery elastic sewed onto the inside which grips the ceramic crock, or the cloth of the brewer tee below it. AND, it not only doesn't leave any gaps where fruit flies can get in, it doesn't slip either. Hannah has even ingeniously designed a peek-a-boo slit in the fabric where you can pull it aside and easily check the temperature of your KT batch. I first thought the Brewer Tee set would just be a cute but superfluous purchase, but after using it I can say that it's almost a necessity. You could get by without it, but really: you're going to be saving so much on making your own Kombucha you might as well spend a little more and get something that'll not only make your brewing more effective, it'll make it look nice on your counter as well! This is a must have. Not only does it look good, but it creates a cover on top that does not slip off. You can also use the different colors to identify the brew inside (if you have multiple systems running). I use the green one for green tea (obvious), blue for Pu-Ehr, and purple for the mix (green, white & pu-ehr). Maybe KK can come out with more colors?